A heatwave is well and truly under way here at the moment. 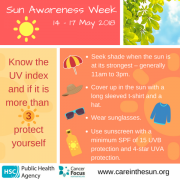 PHA have published guidance on the importance of looking after yourself in the sun and be aware of UV Radiation. Know the UV index and if it is more than three protect your skin and eyes. Seek shade when the sun is at its strongest – generally 11am to 3pm. Cover up in the sun with a long sleeved t-shirt and a hat. Wear sunglasses that have one of the following, CE and British Standard Marks, carry a UV 400 label and offer 100% UV protection. This will ensure they provide adequate protection from both UVA and UVB. Sunglasses should fit your face well and relatively snugly so that light doesn’t enter your eye from around the lens. Use sunscreen with a minimum SPF of 15 for UVB protection and 4-star for UVA protection. Apply liberally 30 minutes before going out in the sun and re-apply at least every two hours.